These kinds of people — what I refer to as marketing solutionists — appreciate a challenge and don’t see failure as an option. They want to see the company benefit, but they also want to get it done for the sake of accomplishing something. It’s a win-win situation. Many factors helped create the marketing solutionist, but the biggest was when the dot-com bubble burst in the early 2000s. Prior to that, money had been rolling in and marketing had what seemed like an unlimited budget. After the crash, marketing teams were still expected to make everything happen — just with a smaller budget and fewer resources. These marketers had to become more resourceful and deliberate. No longer could they just batch and blast their entire database without demonstrating a return on investment. They had to create targeted campaigns and show results. Necessity truly is the mother of invention, and a lot of people naturally progressed into a marketing solutionist type of role in order to get things done. You need to have experts in certain areas. That’s a given. But it’s to your advantage to also have at least one solutionist. That doesn’t necessarily mean you need to go out and hire someone specifically for that reason, especially if you don’t have the resources. The good news is that, quite often, you may already have one hiding in your midst. People often start off in small companies where they wear many hats and gain the experience of a good solutionist. Or, perhaps they survived a layoff and had to learn how to operate with fewer resources as a result. Solutionists are often disguised as specialists, but when a special project comes up they are either the first to offer a solution or will immediately stare off into space while they formulate nearly the entire plan in their heads. Marketing solutionists aren’t always in Marketing Operations, but it’s a good place to start because they’ll have a solid marketing background and been exposed to a number of different marketing tools. When I was with Dell, marketing needed to change way they’d been calculating campaign attribution due to some major data changes they’d had no control over. They spent a couple months putting together their requirements and ideas before presenting them to IT. Despite having a team of thousands of people, IT was under-resourced, in high demand, and wouldn’t be able to get to it for six months. The problem was that marketing needed it in a month. So, they came to a couple of marketing database folks — myself included — who resided within marketing, and not IT. They asked us if we could build a smaller, temporary solution in the interim since they had lost all campaign attribution capabilities. We looked at the requirements, determined where all the data points were, and within two weeks we had a fully working, automated solution. 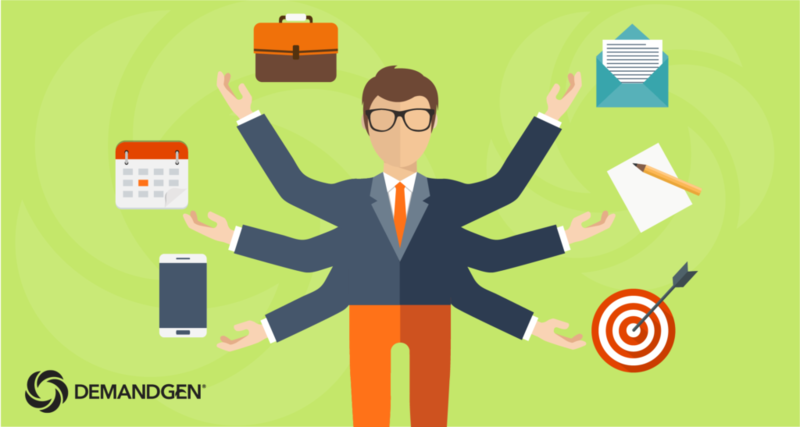 Every marketing organization needs specialists, but it’s important to have a jack of all trades in the mix as well. We live in a data-driven world, and solutionists are able to connect the dots with ease. If you can’t identify someone like this in your organization, the next best thing is to hire a consulting firm to serve as your marketing solutionist. They’ve already put together a team of these types of people, and they can work together to come up with creative solutions to your marketing challenges. I’ve fallen into this role myself here at DemandGen. It’s a challenging but fun position to be in, and it’s never boring. A few years ago, for example, one of our clients was frequently uploading high-volume lists into Eloqua. They spent a lot of time trying to correct each file before uploading it, but poor, insufficient data points were still dirtying the data. They needed a way to validate the data and then fix it before importing it into Eloqua. They reached out to us and gave us their rules and requirements. We hadn’t worked on a project like this before, but figuring it out was part of the fun! While it required a lot of work on the back end, we built a simple-to-use Excel tool with literally three buttons to import the data, evaluate the file, and then export it into Eloqua. After a few clicks and some adjustments to their lists, our client can now be confident they have a fully validated file to import into Eloqua. Here at DemandGen, we come up with unique solutions for our clients all the time. What challenge can we help you solve? Rick Segura, Data & Insights Technical Specialist at DemandGen, is a vastly experienced data guru. Having 20+ years of database experience, Rick is a master of ETL (data processing), data merging & aggregation, report & dashboard development, data analysis, and automation. He is very passionate about delivering intuitive, purposeful data-based solutions.